Women In Welding and Metal Art! 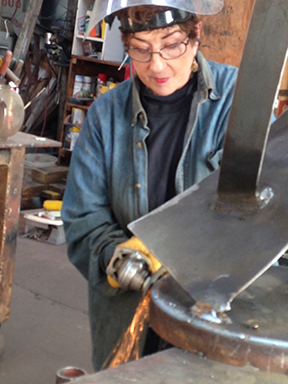 In a male-dominated industry, women in welding and metal art might seem a bit odd. But these women are helping to change the face of the job's stereotypes. A woman with a job outside the home was a rarity, let alone a job in welding, before World War II. However, with all the men off to war and so much to be done at home to make sure they had the aircrafts, ammunition, etc. needed for the war efforts, women went to work. And they did the jobs that previously only men had held, like welding and riveting. Remember “Rosie the Riveter”? Currently, only 7.5% of all welders in the US are women, according to a 2013 study by the US Bureau of Labor Statistics. However, with an estimated growth rate of nearly 15% by 2020, the ratio of men to women in this largely male-dominated work industry is bound to rise. As women make themselves known, showing they are just as capable of handling the work load, or being just as creative as in the case of metal artists, the population’s mindset on women making a career in welding is changing. Let's Look At Just A Few Of Those Women In Welding and Metal Art! Zaddie Johnson: Filling Big Shoes While Men Were at War. When times were tough and Zaddie’s husband, Ted, had joined the military during World War II, she had to find a way to help out with the war efforts herself. After working at a paper mill, she found out she could make more money at the shipyard where Ted worked. That soon led to her becoming a welder, just like him. During the war, as more welders were needed to take on the roles left by the men being shipped out, Zaddie brought in women to do the work. 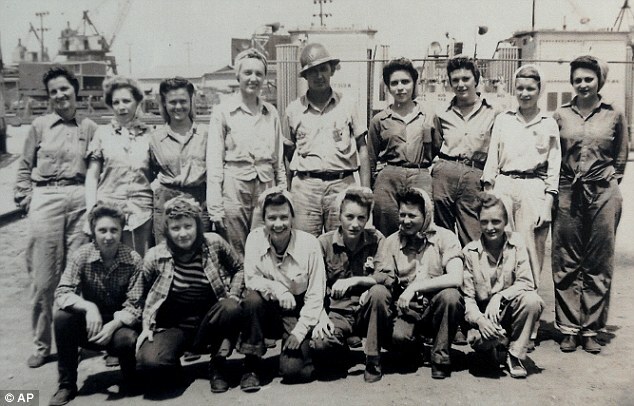 Eventually, she led a crew of welders comprised of only women. Sandy Hussey: Finding Job Security in an Unlikely Place. When in her 20’s, Sandy was on welfare with an infant son and needed a way to both support her family as well as support her dreams of going to college. One day on TV, she saw an ad for a technical school advertising welding classes showing a woman welder. Her first thought was, “If she can do it, I can do it!” Six months later she had her first job in welding and she enjoyed a lucrative career in welding from that point on, able to create a comfortable life for her and her family. 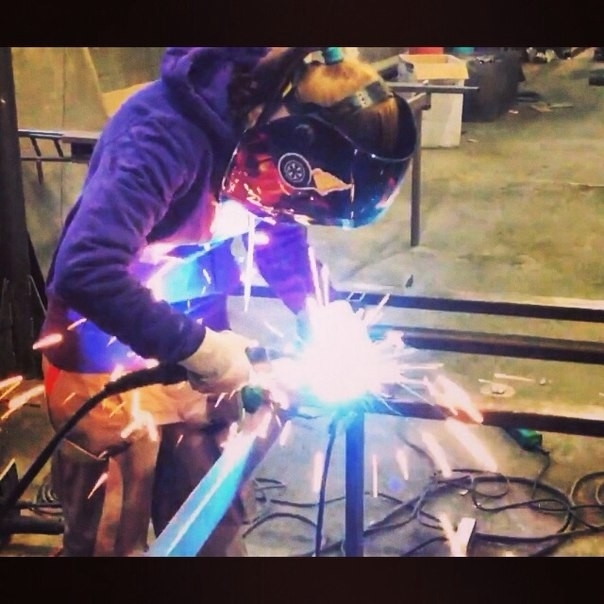 Yelizaveta: An Automotive Welder Finding Fame on Instagram. Yelizaveta is making waves when it comes to women in welding. She isn’t just bucking the norms by being a female welder, she’s becoming an internet sensation with her Instagram account. Erica Heckman: Women Can Become the Best of the Best. Not only can being a woman welder be cool, it can help you win prestigious awards as well. 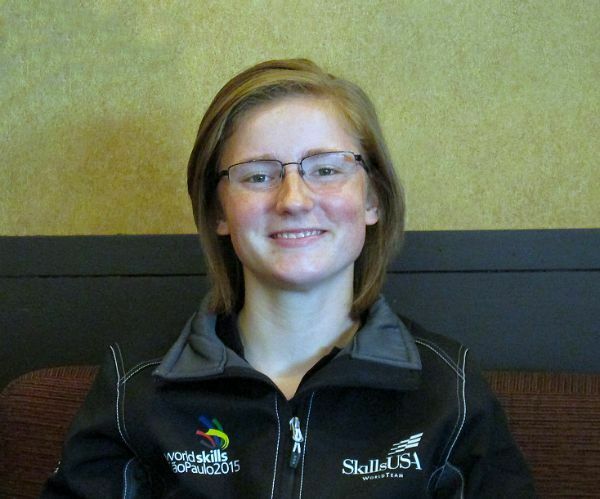 Erica Heckman was sent to the 2015 World Skills Competition as a professional welder. She was just 21 at the time and had just graduated from the Tennessee College of Applied Technology, even though she had been welding much longer. Together with two teammates, they dominated the manufacturing team challenge in Sao Paulo, Brazil. Gertrude Barnstone: Making a Statement, Asymmetrically. You don’t just have to make your welding skills a work thing. You can make it an art thing. And that is just what Gertrude has done. 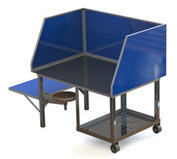 She even thinks outside the box when it comes to shapes, especially when it comes to things that are usually shaped like boxes… like end tables. 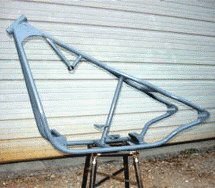 There’s nothing saying that you can’t have a little bit of fun with metal and a welder. Michelle O’Michael: She Has Something to Say, and She Says It Big. The artwork that Michelle creates is a tad larger than end tables. In fact, it can tower over you to create impressive displays in parks, in front of corporate buildings, and more. She says that welders were her mentors, especially after having a welding instructor that might not have warmed up to the idea of having a woman in his class. Barbie the Welder: Determined to Make Her Art. She was inspired by a movie to become a metal artist. She saved up to go to school to learn. She became a metal fabricator and worked hard to buy a home just so she could have a garage to work in. After saving up the funds to work her metal art full-time, she does so and has since 2014. 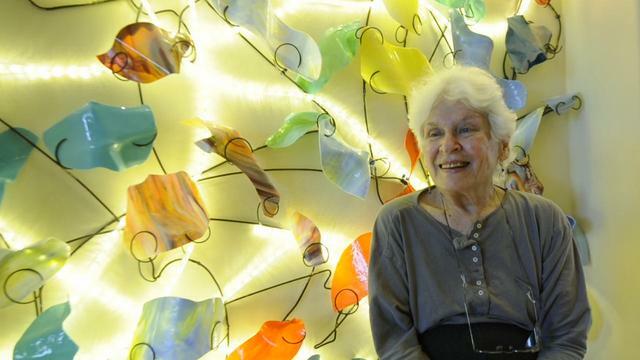 Her art is seen in New York art galleries and has been shipped to clients in 13 different countries. Her determination has set her apart. When you are inspired to do what you love, you do it no matter what. We have a special place in our hearts for Barbie because when she was just getting started she contributed to this site when her business was just starting out and it was called Wonderland Welding at the time. Women may have fit into perfectly designed roles a long time ago, but this day and age has brought on new a new norm: that women can do whatever they set their mind to. The women above have set their minds on doing something that not many women do: welding. 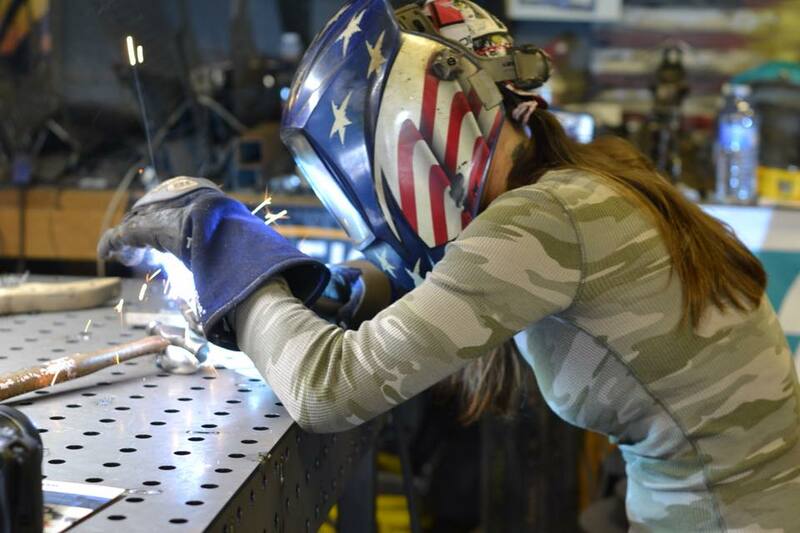 Whether they are stepping in when needed, trying to support their family, fulfilling a passion, or even creating beautiful artwork for all to enjoy, women in welding are carving out a new place for themselves in this male-dominated industry. This image is of Evelyn Spangler. She was just eighteen-years-old and according to her welding instructor, Evelyn was just as good as any of the men at acetylene torch welding. She is one of many who helped pave the way for women in a male dominated industry. 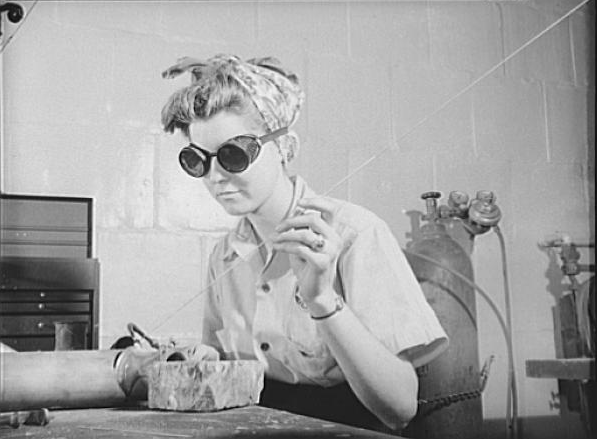 Learn more about historic women welders.